In March 2018, readers were introduced to a robotic talking raven, a 14-year-old orphan and an unconventional wizard and his clever daughter. 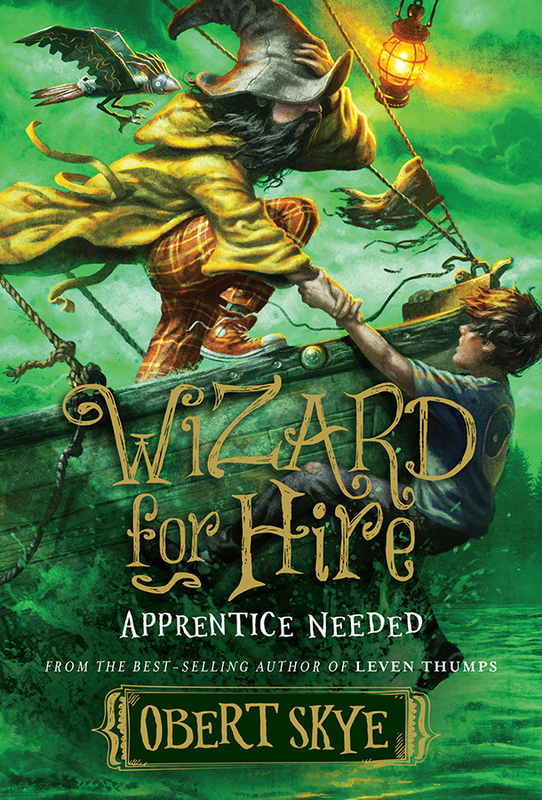 Now, Obert Skye is back with the second book in his Wizard for Hire series, Apprentice Needed. Wizard for Hire saw Ozzy hiring a wizard, Rin, from a classified ad. Rin’s a strange kind of wizard in that he never seems to cast any actual spells. But Rin believes Ozzy, and there’s a lot to Ozzy’s story that’s unbelievable: At the age of 7, Ozzy’s scientist parents were kidnapped and Ozzy has been living alone (save his robotic bird, Clark) in the woods since then. Rin agrees to help Ozzy find his parents in what turns out to be the biggest adventure of Ozzy’s life. Apprentice Needed opens on a dark and windy night. It’s the kind of weather that would make people stay indoors, but not Ozzy. Instead he steps out of bed, jumps out his window and walks straight into the ocean. It’s odd, yes. But what makes it downright scary is Ozzy has no idea what’s going on. It’s like someone is controlling his mind. Luckily, Rin’s daughter, Sigi, and Clark are able to save him. Ozzy could really use Rin’s help right about now, except the wizard hasn’t been seen since he slipped away some time ago. When a mysterious package arrives containing a plane ticket and thumb drive, Ozzy’s sure it’s from Rin. But when Ozzy, Sigi and Clark arrive in New York, Rin isn’t there. Instead they’re met by the man who was the financial backer behind the mind-control serum created by Ozzy’s parents. And he wants Ozzy. Because Ozzy is the final test case. As is often the case with the enigmatic wizard, Rin appears just in time to save Ozzy and Sigi, but he’s not on a rescue mission. No, Rin needs an apprentice to enhance his status in the magical realm of Quarfelt. He wants Ozzy to be that apprentice. Ozzy’s not so sure now is the best time to become an apprentice. Especially given his “wanted” status, but it appears he has no choice. Time is running out, and Ozzy’s got to make the best of it. Apprentice Needed is one of the better sequels I’ve recently read. In fact, it’s probably better than its predecessor. Even though it would have been better to read both books in succession, Skye does an excellent job of recapping previous information without making it feel like a highlights reel. Skye’s writing is on-point. While his characters are suited for upper middle-graders, Apprentice Needed screams to be read out loud. Short chapters, snappy dialogue and cinematic scene building push the plot forward to a point where the text fairly hums. Apprentice Needed ends with the same sort of satisfying conclusion that sets up the next novel yet feels complete. This is an excellent series that will appeal to seasoned and reluctant readers alike.